On June 22, 2014, a regular birder of the Chelsea area in Manhattan found, photographed, and reported a Eurasian Collared-Dove in the area of Pier 63, the northwest corner. He saw it only briefly before it flew up into trees, and he could not relocate it. I did not chase the observation, though others did, and none reported success. This morning another birder reported what is almost certainly the same bird twice, first at 7 a.m. and then again at 8 a.m., on the artificial-turf soccer field inside Chelsea Riverside Park, not far from the location of the June 22 sighting. Now it was clear that the bird had chosen to linger in the area, and a chase would be worth the crosstown trip. 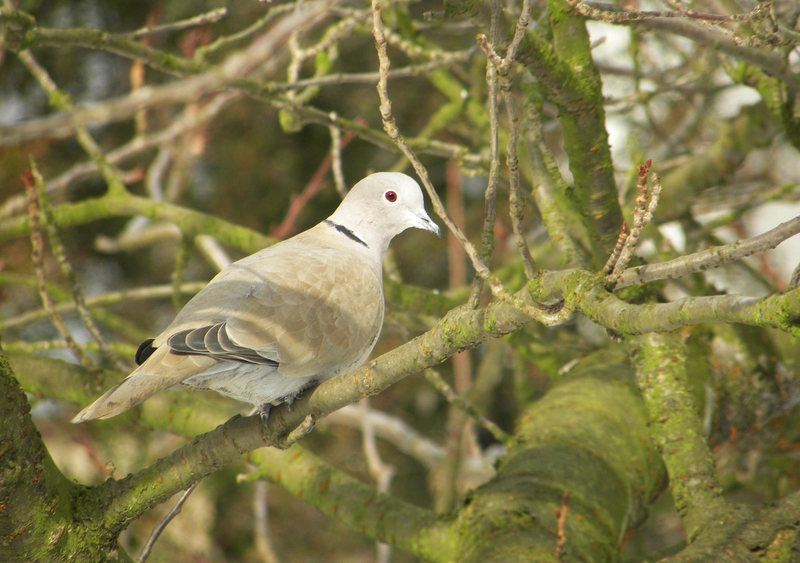 I found the Eurasian Collared-Dove almost immediately. It was alone, walking on the grass just south of the southeast end of the soccer field. It let me approach to within twenty feet or so, and I got clear views of its relevant field marks — most notably, the black half-collar on its nape. Prior to June 22, there were no prior eBird observations of the species in New York City. There have been more frequent reports of it in New Jersey and Pennsylvania. It is considered an invasive species, and has long been common across the southern and western United States after reaching Florida in 1982. There is no reason to think it could not do well in New York, as it generally nests near buildings and has been reported as far north as Alaska. The Eurasian Collared-Dove was my 186th species of the year in Manhattan. It was also my 242nd lifetime Manhattan species. This entry was posted in Uncategorized and tagged birding, birds, Chelsea Riverside Park, David Barrett, Eurasian Collared-Dove, Pier 63 by David Barrett. Bookmark the permalink.